B.M. 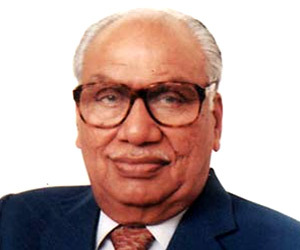 Munjal (Brij Mohan Lall Munjal) is the Chairman of the Hero Group. He is a first generation entrepreneur who started very small and through sheer hard work and perseverance made it to the top. Today, Hero Group is the largest manufacturer of two-wheelers in the world and Brij Mohan Lal Munjal is the man widely credited with its success. B.M. Munjal's journey began in 1944 at the age of 20. Brij Mohanlall along with his three brothers, Dayanand (32), Satyanand (27) and Om Prakash (16) moved from his birthplace Kamalia in Pakistan to Amritsar. The brothers started supplying components to the local bicycle business. After partition in 1947, the family was forced to move to Ludhiana. The town of Ludhiana was already a major hub of the Indian bicycle business and an important textile center. The Munjals slowly spread their bicycle component distribution network in other parts of the country and became one of India's largest bicycle parts suppliers. In 1952 Munjals made a shift from supplying to manufacturing. They started manufacturing handlebars, front forks and chains. In 1956, the Punjab state government announced the issue of twelve new industrial licenses to make bicycles in Ludhiana. The Munjal brothers cashed on this opportunity. Helped by the Punjab government financing of Rs 600,000 to supplement their own limited capital resources, the Munjals set up Hero Cycles. Hero Cycles was registered as a 'large-scale industrial unit' and it initially produced 7,500 units per year. Soon Hero Cycles started giving well-established players such as Raleigh, Hind Cycles, and Atlas Cycles a run for their money. The hero cycle was comparatively cheaper and was sturdy and reliable. It gave the customers value for their money. In January 1984, Japan's Honda, the world's largest manufacturer of motorcycles, elicited interest in collaborating with the Hero Group to manufacture motor cycles in India. An agreement was signed and on 13 April 1985, the first Hero Honda motorbike was rolled out. Today, the company is the largest manufacturer of motorcycles in the world. For his outstanding contribution to the success of Hero Group, B.M. Munjal was honored with Ernst & Young's Entrepreneur of the Year award in 2001. 84 Things NOT to Do in Mumbai !! !